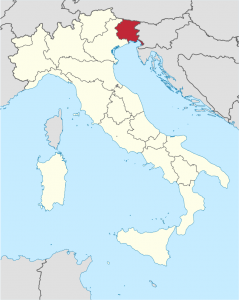 Tucked in the northeast corner of Italy bordering Austria and Slovenia, Friuli is a relatively small region with international recognition. It shows up on the world wine map for its long list of indigenous varieties and its distinctly aromatic whites. The terrain varies throughout, but most quality production takes place where days are warm and sunny while nights are chilly. Thus, a classic balance of high acidity and generous sugar levels mesh for concentrated aromas. Most whites are built for daily consumption, lending themselves to a lightly fruity, crisp and savory style, but the real jewels are built for longevity via barrel aging and/or skin contact. Commonly made from the prized Ribolla Gialla or Friulano. Red wine production sees a lot of international influence and grapes like Cabernet Sauvignon and Merlot have fared quite well. The long growing season provides maturation for these late ripening grapes while the cool nights keep them zippy and bright. However, the real excitement lies in the noble obscurities like Tazzelenghe, Pignolo, Schioppettino and Refosco. All unique in their own right, these are the local legends that have been enjoyed for centuries. Less in the international limelight, but always revered in the region among locals. Copyright © 1978-2019 Siena Imports, LLC. All Rights Reserved.